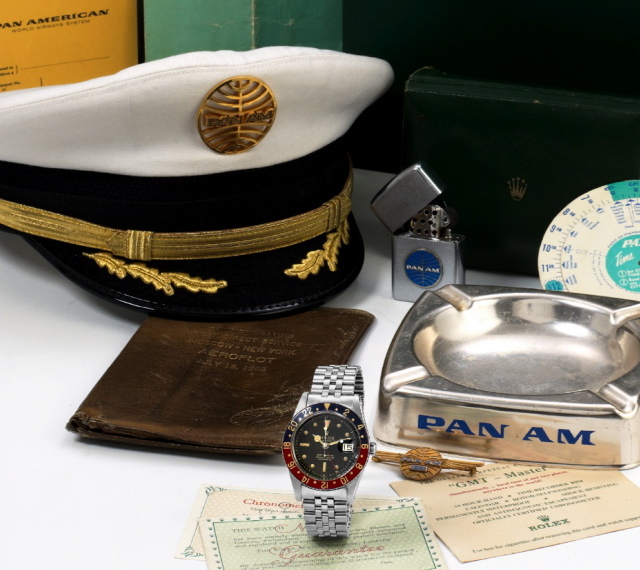 At Antiquorum’s important watches sale in Geneva this weekend: a Pan Am pilot’s 1957 Rolex “Tropical Dial” GMT-Master, complete with the flyer’s cap, briefcase, lighter, ashtray and flight instruction manual, estimated at $27,000 – $38,000 (Read more at A Continuous Lean). We ourselves sport the modern offspring of this model, the GMT-Master II. Damned handsome it is too, though we’re thinking of upgrading to the new 40th anniversary “Steve McQueen” Explorer II. This entry was posted in Classics and tagged 1960s, A Continuous Lean, Antiquorum, auctions, Pan Am, Rolex, Rolex GMT, watches. Bookmark the permalink.